There’s Something Interesting Going On in Here. Here Shop and Gallery, situated on Stoke’s Croft, central Bristol, though a sizably small space, tidily houses a plethora of printed images, illustrations and photographs published in and on just about every type of trendy paraphernalia that might be saleable; zines, books, bags, toys, stickers, badges, et al. But despite the fact that everything is for sale, Here Shop and Gallery remains a space one can visit just to look at artful things – something of a rarity in these highly commoditised times. Entrance is at ground level and immediately positions the visitor well within the ‘Shop’ section of Here. Down an extraordinarily narrow staircase is a space no larger than a public toilet which then constitutes the ‘Gallery‘ section. The gallery is a rentable space which means it costs the artists a flat fee for exhibition in addition to the commission Here Shop and Gallery take from sales of their works. Factoring in the costs to the artists, the works themselves are (for the most part) reasonably priced; items in this particular exhibition span a price range of £3 to £350. The current exhibition, titled Land & Sky, showcases the work of illustrator Lizzy Stewart and mixed media artist Christopher Bettig. Stewart’s work consists primarily of detailed line drawings of Victorian houses alongside bears, wolves, birds, and other such woodland creatures. From humans with animals coming out of their heads to animals with houses coming out of theirs, Stewart’s designs are imaginative and charming if a little sentimental. Certainly there is a great level of skill here and every third or fourth print offers something of a pleasurable cynicism towards contemporary human existence; one particular drawing of fine directional lines reveals a human silhouette accompanied by the words, ‘They Are on The Insides of My Eyes’. Christopher Bettig’s works complement Stewart’s illustrations by bringing collage and mixed media, adding a third dimension to the visitor’s experience of the space. 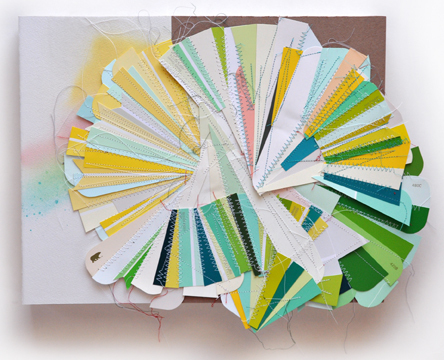 Bettig’s main works consist of latex paint, spray paint, paper, plastic and thread on paper or wood. In addition to these more traditional mounted artworks there are several printed synthetic fabrics sewn into ‘flags’ and displayed on string, much like bunting, and installed across the centre most space of the room. Non confrontational geometric shapes, mostly circles, wheels and fans, are transposed onto squares and rectangles. Subtle rather than abrasive, the shapes in Bettig’s work are contemporary and recall modes of graphic design that are most often seen in high street fashion and Paperchase stationery (it is no coincidence that Bettig’s CV boasts designs for Urban Outfitters). Paper, thread & spray paint on wood. Most works to appear in the Here Shop and Gallery (past, present and future), will likely fit the adjectives aforementioned; imaginative, charming, subtle and contemporary. Here Shop and Gallery occupies a popular local niche; situated amidst the hub of all things PRSC and all things ‘community’, as it were, Here Shop and Gallery sells and exhibits the types of artworks its customer base can/do create themselves; and what better way to ensure its support and purchase than through the commoditisation of narcissism?